How do I become an Augustinian Recollect Priest, Brother, or Deacon? • Be a believing and practicing male Catholic. • Have a High School education or the equivalent. • Be free of any financial obligations (debts). • Be free from any immediate commitment to help your parents or other family members. • Be disposed to live and work with others rather than alone, and to place community interests over personal ones. • Be open to work in a multi-cultural environment and be willing to learn Spanish. • Get to know the community through vocational retreats and personal visits. • Be willing to submit to a psychological examination. What is the training process for becoming an Augustinian Recollect? After being accepted by the community's admission board, you would pass through the following stages of preparation ("formation") to become a full member of the Augustinian Recollect Order. These stages take into account the growth of the whole person - physical, emotional, intellectual, and spiritual - with the ultimate goal of forming a fully mature and committed disciple of Jesus Christ. • Length of time: (6 months to 2 years). • Place: St. Augustine Priory, Oxnard, California. • Goal: To introduce and familiarize you with the realities of living in a religious community, which is a life of prayer, study, manual labor, ministry and socializing or recreation. • Studies: Introduction (or continuation) of college level courses with emphasis on liberal arts, including languages (English/Spanish), and philosophy. • Psychological testing and workshops are part of the program. • Acceptance into novitiate would require positive vote by the community (formation chapter) as well as your own expressed desire to continue in the program. • Length of time: (1 year). • Place: Augustinian Recollect Monastery, Monteagudo, Spain. • Goal: To develop your interior life (prayer) and sense of living in community, and help you (and the community) decide whether you should make a commitment as an Augustinian Recollect priest, brother, or deacon. • Studies: History and Nature of Religious Life; Rule of St. Augustine; Constitutions and History of the Order. • Profession of Temporary Vows (click here for more information). • Length of Time: (3 to 6 years). • Place: Tagaste Monastery, Suffern, New York. • Goal: To equip you intellectually and spiritually to live and work as an Augustinian Recollect. A. Priest: Philosophy and Theology. B. Brother: Specialized studies depending on projected career: i.e., teacher, chaplain, administrator, etc. 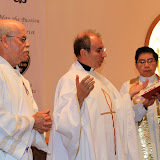 C. Deacons: Specialized studies centered on Theology. Whether a person chooses to be a priest, brother, or deacon, he must make temporary vows for at least three years before being called to final or solemn vows. With the approval of the community he is then free to profess these vows and embrace this way of life permanently, or "until death." • Ministries and Orders - Priesthood Candidates only (click here for more information). • The Augustinian Recollect is assigned a mentor (a senior religious) to guide him in his first years of ministry ("Transition Program"). • The Augustinian Recollect throughout his religious life commits himself to cooperate with God's grace in deepening his religious vocation, his vows and his personal and professional abilities through a life of good works (bene vivere), study (bene studere), and prayer (bene orare).